get it you never quite know what to do with it? and I just had to have it!!!! …I still had no idea what to do with it. and then use the diamond stamp behind her. with a pop of red…and just a hint of brown. and a slash of brown on the lady’s hat. that has been inked with spun sugar DI and edged with barn door. The outer bits are coloured with London Fog Memento and black DI. With a little grey crackle stamping. on the stenciled diamonds, which are done in texture paste. A huge thankyou and welcome to some new followers, I hope you enjoy my journey! ~ Flourishes Timeless Tuesday – I’m Seeing Red! I love these kind of diamonds! What a beautiful display of stamped images and great masking! Goregous all the way! Hugs! A beautiful card Dot. Wonderful composition and the more intense touches of colour really pop. The card is gorgeous! 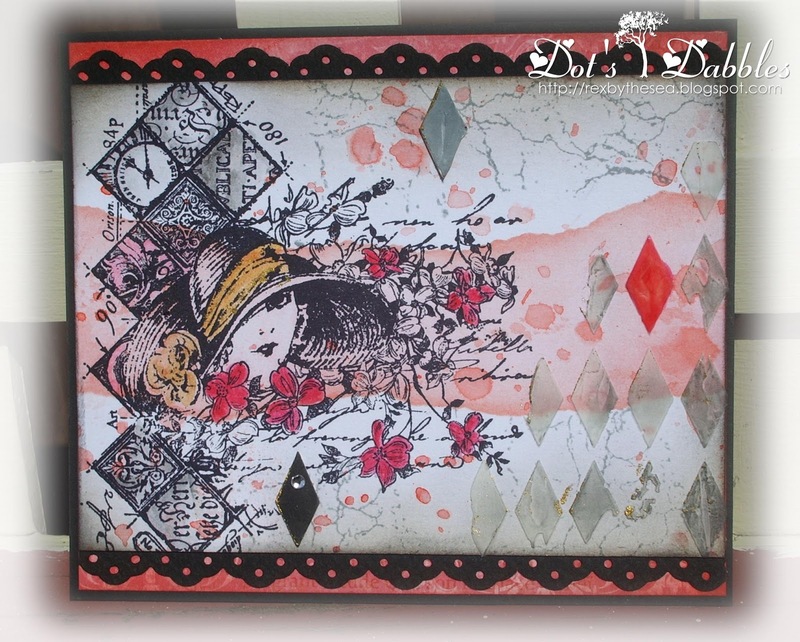 Love the image and colors!Thank you for playing with us at Crafts 4 Eternity! Very beautiful vintage card Dot. love the way you used the stamps. Gorgeous card, great masking and backgrounds. An amazing piece Dot, love the fusion of colours and how you've effortlessly blended the images together. Love your card.Great way to use the colors! Have a great week. A wonderful card, the images are great and the background stunning. Great vintage card! I love how you used those diamonds. I've done that plenty of times – I actually have a basket of stamps that I saw an idea with and thought I had to have it but there it sits still in a basket cause I don't really know what to do with it. So Kudos to you as you used it beautifully. thanks for joining us this week at ATS&M. A real stunner Dot. Love that gorgeous image and diamonds really do look fab with her! Love, love, love that stamp. Everything you make with it is so different and amazing.